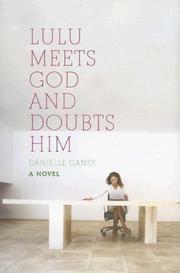 Chick lit seeks out culture in Ganek’s debut, an art-world romance. With more than 300 galleries huddled in Chelsea alone, the New York contemporary art scene is bound to get incestuous. So finds Mia McMurray, a budding “gallerina,” or gallery receptionist (they are known, for the most part, for their haughty attitude, good looks and expensive clothes), at the mediocre Simon Pryce Gallery. But Mia fancies herself different from the others—particularly the loathsome Alexis Belkin—and tells herself that she is working at the gallery only to support her own artistic aspirations. Things heat up at the gallery when Simon holds a show for the talented but unknown Jeffrey Finelli, who is hit by a taxi on the night of his art opening. Suddenly, demand for the paintings is high, particularly the masterpiece Lulu Meets God and Doubts Him. The painting is desired by a well-known collector, the classless wife of a nouveau riche businessman and other players, but the painting’s muse, Finelli’s estranged niece, Lulu, comes forward and claims that the piece was promised to her. Lulu and Mia forge an unlikely friendship, and, as Mia is thrust head-on into the world she has long admired largely from the sidelines, her romantic life takes an unexpected turn. After insisting that she wouldn’t date Zach Roberts (a young, smart, handsome art dealer) because he makes his money in the art world, Mia finally, predictably, succumbs to his charms. Meanwhile, Lulu quits her Wall Street job to become a painter and falls in love with a famous young artist, and Mia quits the gallery and becomes a writer. The Finelli changes hands again, selling at auction for a remarkable sum. The contemporary art scene is a fun, juicy setting, but Mia is, if not a typical Gallerina, certainly a typical chick-lit heroine: insipid and entirely predictable.